MISSION, KS--(Marketwired - Jul 14, 2014) - (Family Features) You can heighten the fun of every outdoor gathering with the right nibbles, noshes and refreshments. A fruitful al fresco experience involves lively conversation with good friends, easy finger foods and tasty, versatile drinks that fit the laid-back atmosphere. For the hosts who long for a successful backyard bash, consider serving palate-pleasing Moscato. This deliciously sweet wine varietal has become very popular as its approachable flavor profile is a guaranteed crowd pleaser. In addition to the classic peach taste of the Gallo Family Vineyards Original White Moscato, try the aromatic orange blossom notes of their Pink Moscato or the yummy red berry finish of their Red Moscato. Or, dust off your finest barware and make a splash by serving simple wine cocktails. Whether it's a refreshing spin on a classic, like the Moscato-lini below, or your own recipe, Moscato's fruit-forward flavors make it a great and unexpected base for cocktails. Label your food offerings for guests in a fun way by cutting a slit in wine corks and inserting a small card. Help guests cool down by serving sweet wine cocktails on ice. Give your guests a fun way to keep track of their drinks by painting the bottom of wine glasses with chalkboard paint. Guests can use chalk to write their names and draw pictures. For other ideas to make outdoor entertaining a hit, visit www.GalloFamily.com. In large bowl, stir together sausage and Moscato until combined. Using medium cookie scoop, form meatballs and place on baking sheet, evenly spaced. Bake for 25-30 minutes or until no longer pink. Meanwhile, in small bowl stir together all other ingredients to create yogurt sauce. 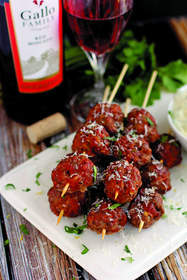 Thread meatballs onto skewers and serve alongside yogurt sauce. Garnish with additional cilantro and grated Parmesan cheese, if desired. To make fruity layer, combine sugar and water in small saucepan. Heat over low, stirring until sugar dissolves. Remove from heat and let cool completely. Add cooled syrup, strawberries and salt to jar of blender and puree until almost smooth, leaving bit of texture. Stir in pink moscato. To make creamy layer, place everything into a 4-cup capacity measuring cup with a spout and whisk together until well combined. To freeze, fill ice pop molds about one-fifth of way with either mixture (layers can be any size or amount you choose). Put in freezer until first layer is set enough to hold another layer, 60-90 minutes. Store mixtures in fridge between layers. Remove and fill another one-fifth with opposite mixture. Return to freezer until layer is set. Repeat until molds are filled to top, adding ice pop sticks in once third layer is added (adjust to type of ice pop mold). Note: If you don't want layers, whisk mixtures together. You can also make each layer into its own ice pop, if you choose. Combine blackberries and water in blender and puree until smooth. Strain through fine-mesh strainer, discarding seeds and solids. Fill bottom of chilled Champagne coupe with blackberry puree. Top with Moscato and garnish with fresh blackberry. 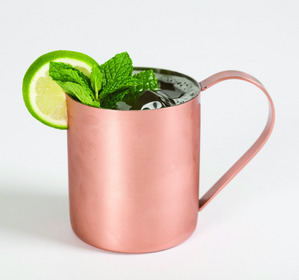 Pour ginger beer, Moscato and lime juice into ice-filled copper mug. Garnish with lime wheel and mint sprig. Muddle lime, basil leaves, and sugar in bottom of cocktail shaker. Fill with ice; add Moscato, white rum and mango nectar. Shake and strain into ice-filled rocks glass. Garnish with basil sprig. Moscato is more than just a dessert wine. It tastes great with a variety of food and particularly helps balance out spicy dishes that heat up the night. No matter what cuisine you're cooking up, a chilled glass of Gallo Family Vineyards Moscato and the pairing guide below are the perfect combination to elevate your outdoor engagements. White Moscato: The honey notes are a perfect match for grilled seafood, such as shrimp or trout. Pink Moscato: Great paired with spicy Asian or Mexican dishes, and complements everyday desserts. Red Moscato: This refreshing red is served cold. Try it with light cheeses and juicy burgers.